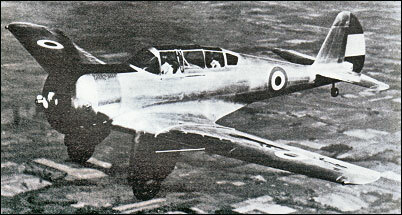 The CW-19L Coupe was designed by George Page as an advanced all-metal two-seat cantilever low-wing monoplane for the private owner. Built in 1935 and powered by a 67kW Lambert engine, tests showed it to be manoeuvrable but underpowered. The CW-19W retained the side-by-side cabin layout of the earlier machine but replaced the Lambert engine with a 108kW Warner Super Scarab. Another feature common to the whole CW-19 series was the streamlined 'trouser-type' fairing over each main unit of the fixed landing gear. The militarised CW-19R was a radical redesign intended for the export market. The two-man crew was accommodated in tandem under a long sliding canopy and there.was provision for a forward-firing synchronised machine-gun plus another gun on a flexible mounting operated by the observer; light bombs could be carried on underwing racks and additional guns for ground attack could be attacked to the landing gear fairings. The Curtiss-Wright management believed the CW-19R would satisfy a need for a utility fighter, reconnaissance and ground attack aircraft. In the event sales were limited, comprising 20 aircraft purchased by China and three by Cuba. Power was greatly increased, the CW-19R having a 261kW Wright R-760E2 (J-6-7), with the 336kW Wright R-975E3 (J-6-9) as an alternative; the aircraft demonstrated good flight characteristics and had an outstanding rate of climb. An unarmed basic trainer version of the CW-19R was built as the CW-A19R. Flown in February 1937 it was tested by the US Army but no production orders followed. Three were completed, one being converted subsequently to a CW-22. The sole CW-23 was developed from the CW-19R. It had a 447kW Pratt & Whitney R-1340 Wasp engine, inward retracting landing gear and was intended as a basic combat trainer for the US Army. Flown in 1939, official testing led to its rejection for production. I need a 3 view diagram of Bolivian Curtiss Falcon .Does anyone have it ? Kindly email them to me. Please? Many ,many thanks ! I have tried to email Manuel Ozuna, but that email address is no longer working. Should anyone know him, they might like to ask him to make contact with me. I too am a modeller, and have a lot of research material on the Curtis Wright 19-R and am about to start a build. Right--There is an airworthy example in California owned by a fine genteleman who still ocassionally flys the beauty. This airplane is fitted with Wright J-6-9 (R-975). This is the ex bolivian "gate guard". There is a beautiful example of this aircraft at the Dominican Air Force base in San Isidro,wich took part in a good will flight in 1937. (see vuelo panamericano @google).There is an ex Bolivian Air force airworthy i think,somewhere in Texas.I am a model builder trying to build a model of this aircraft,but will have to modify a Curtiss Falcon SNC-1.You can email me to exchange information. My father was a Cuban Air Force flight instructor who was killed together with a cadet flying the Curtiss-Wright CW-19R on October 21, 1941. They were practicing Force Landing maneuvers and the engine failed resulting in the aircraft stalling very close to the ground. I was two years old at the time but I went on to become a commercial airline pilot. Thanks to this web site now I know what the aircraft in which my father died looked like. You must need put the histori of this plane in Bolivia and latin america, maybee you have better luck than mee founding data and technical views of this plane, I only have the 3 view drawings.